Dan (1973) studied Mechanical Engineering in Utrecht, and Business Administration at Erasmus University (Rotterdam). He worked in several positions at Gastec, a gas research institute, on gaseous automotive fuels such as CNG and LPG. In 2004, he joined Wärtsilä Netherlands as account manager for the Benelux dredging industry. In 2008, Dan became responsible for the Sales department of Wärtsilä Benelux Services Division. In 2010, he moved to Wärtsilä Services - North Europe and worked as business development manager on new technologies, such as emission abatement and use of LNG as marine fuel. 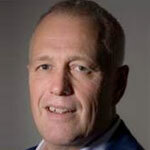 In 2012, he switched to TNO as senior business developer Maritime & Offshore. Within TNO, he has developed several Maritime R&D projects mostly focussing cleaner fuels for ships and on energy-efficienct shipping. Project he helped develop are the EU FP7 project Retrofit, and the Dutch joint industry project Hybrid 111, focussing on energy simulation tools for hybrid propulsion trains. In 2015, he developed a project for shipowner Flinter, with the aim to investigate if data could be used to monitor ships. In March 2016, he started the company We4Sea, together with Michiel Katgert. We4Sea uses big data and simulation technologies to monitor ships, and optimize their fuel efficiency.